Our faculty consists of very carefully chosen instructors. They all have a background working in the entertainment business and most of them are still actively pursuing their careers. There’s also several times a year when special guests and friends of The Rhythm Room are travelling through Vancouver so students are often given the chance to dance with amazing, world class dancers. 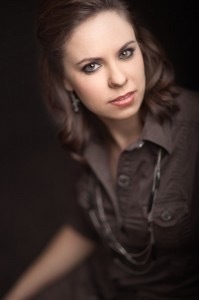 Jennifer Bishop has been teaching, performing, adjudicating, choreographing and producing for over 15 years. She is highly sought after as a dance coach, performer & consultant. Gandalf (Sir Ian McKellan) tops her list of celebrity students. As a choreographer her credits include numerous commercials, TV shows, feature films and theatre productions. She has had the privilege of performing on the Vancouver stage at The Arts Club Stanley Theatre (West Side Story, Singin' in The Rain & Cabaret), The Vancouver Playhouse (Guys & Dolls and The Music Man), The Vogue Theatre (Godspell), The Centennial Theatre (Godspell and Wizard of Oz), Harmony Arts Festival, Chutzpah Festival, Vancouver International Dance Festival, The Vancouver Tap Festival and Theatre Under the Stars (West Side Story x 2!). Her performing career has allowed her to travel across North America and as far as Taiwan for an adventure as a singer with a top 40/funk band. Most recently, she has joined Burstin' With Broadway (a 150 member choir) as their Choreographer. In 2007, Jennifer found a fabulous dance space and The Rhythm Room was created. A place for all things percussive! : ) And in December of 2017, The Rhythm Room added a second location at #109-3701 Hastings Street. Jennifer is actively involved in the community, supporting up and coming dancers and encouraging their continued growth through exploration in their studies with as many different instructors they can experience. She endeavors to stay active as an artist through studying different forms of dance, jamming with her husband, Bill Costin and dancing with their 9 year old daughter, Olivia Love. Select theatre credits include: Frumah Sara in Fiddler on the Roof and Logainne Schwartzandgrubenierre in The 25th Annual Putnam County Spelling Bee (Western Canada Theatre); Betty Jean in The Marvelous Wonderettes (Hey Look! It’s a Co-op); Tammy in Hairspray (Arts Club Theatre); Annie Oakley in Annie Get Your Gun and Miss Dorothy in Thoroughly Modern Millie and Crystal in Little Shop of Horrors (Theatre Under the Stars); Agatha in Guys and Dolls (Chemainus Theatre); Ruthie/ Ned in Bat Boy (Patrick Street Productions); Linda in Evil Dead (Down Stage Right); Cordelia in Falsettos (Chutzpah Festival); Cowgirl in Somewhere In The World... and Baby Bear in Not Wanted on the Voyage (Charlottetown Festival); and her favourite credit, two years of playing The Wicked Witch in The Wizard of Oz at Carousel Theatre. In her “spare time”, Meghan is also a well sought-after teacher and choreographer throughout the Lower Mainland. She is passionate about sharing her knowledge and enthusiasm with everyone young and old (and all those in between). She has been a guest instructor at the Arts Club, Theatre Under the Stars, and many many others. Meghan also assistant choreographed the BC celebration ceremony for the Vancouver 2010 Olympics. Amy has trained and performed extensively in Tap, Jazz, Ballet, Modern Contemporary & Lyrical Jazz from a very young age, and has been teaching and choreographing Tap full-time for over 21 years throughout the BC. She has a long list of accomplishments and award-winning competitive performances in Canada and the U.S. 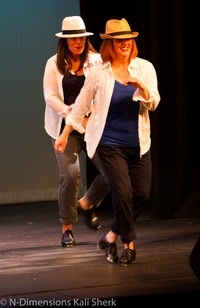 In July of 2009, she and 22 of her students participated in the “New York City Tap Festival” where they trained with world-renowned Masters and by audition, were chosen to perform their award-winning routines “Off Broadway” to a sold-out theatre. That evening Amy was honoured with being chosen as the recipient of the “2009 NYC Tap Festival Outstanding Teacher/Choreographer Award” for her “Outstanding Dedication and Commitment to the Art of Tap Dancing”. Her passion for Tap leads her to train extensively each year (for the past 26 years) in advanced/accelerated workshops and festivals throughout the U.S. and Canada. Not a year goes by that she doesn’t put time into her own professional development. Locally, Amy has also participated in the Vancouver Tap Festival in Vancouver for 13 years and was privileged to perform in the 2003 Festival finale at the Vancouver Playhouse, “It’s About Time, It’s About Tap”. Since its inception Amy’s students have been picked to perform in West Coast Tap Dance Collective’s International Tap Day celebration. Raised in Calgary and transplanted to Vancouver over a decade ago, Peggy is extremely proud of her ‘homegrown’ Western Canadian talent and training. With over 20 years of professional teaching experience, her own small business/production company and a recently revived performing career, Peggy is constantly reinventing herself and achieving rare longevity in the dance industry. 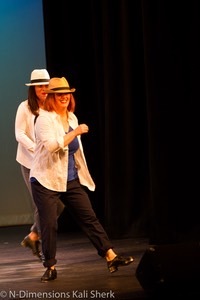 When not teaching around Vancouver, Peggy can be seen performing in collaborative tap works, solo pieces and tap jams all over the lower mainland. Peggy is also a much loved guest instructor who is invited to teach master classes and summer schools at home and across the western provinces year after year. 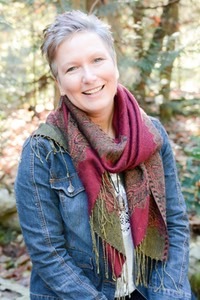 A respected adjudicator for provincial and national level competitions, she has also received numerous choreography awards and recognition for her charitable contributions to various visual and performing arts programs in BC. Her students –both past and current – continue to find great success as performers In Toronto, New York, Las Vegas and Los Angeles, touring with shows such as Stomp!, Wicked and Mary Poppins. Just as many others have followed in her footsteps to become outstanding teachers, choreographers, studio owners and company directors. Never one to be idle, Peggy also works as a 911 Emergency call taker for the Vancouver Police Department and is developing her portfolio as a freelance writer as well. Jim Hibbard’s professional career has spanned more than 50 years. 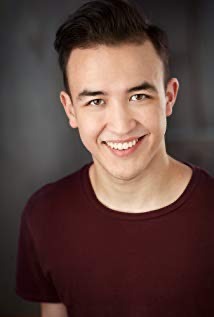 He has worked in film, television, stage and nightclubs in disciplines such as dancing, singing, acting, choroegraphing, directing, producing, writing and post production foley work. Jim's film work includes HELLO DOLLY, with Barbra Streisand, GYPSY with Natalie Wood, THOROUGHLY MODERN MILLIE with Julie Andrews, BYE BYE BIRDIE with Ann Margret, six films with Elvis Presley, FINIAN'S RAINBOW with Fred Astaire and choreographing A VERY MERRY, MUPPET CHRISTMAS, for Jim Henson's production company. Graeme grew up in Brooks, Alberta where he started dancing at the age of 3. There he trained at Rhythmic Soles Dance Academy, beginning in Tap and then branching out into Ballet, Jazz, Hip Hop, Contemporary and Musical Theatre. Right from the start Graeme showed unmatched love for performing and felt comfortable in the spotlight. The stage became a place where he could break out of his shell, as he was a more reserved and quiet person. Along with dance, he expressed his artistic side with his love for music. Starting in piano and then tackling guitar and drums he soon became quite the musician. After graduation Graeme looked to advance his training to the professional level. He made his move to Vancouver to train at Harbour Dance Centre as a member of the Intensive Training Program where he had the opportunity to train with the top choreographers in Vancouver. 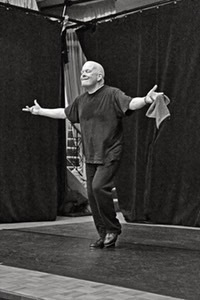 After ITP Graeme completed two years with Joanne Pesusich and the Source Dance Company. In the company he started to develop his personal style as a dancer and began to explore creating choreography. As well as teaching at The Rhythm Room, he also teaches classes at Harbour Dance Centre the new Kelly Kono Studio on Bowen Island. 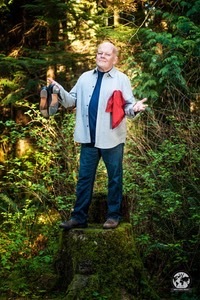 He has appeared on stage with Gateway Theatre (The Music Man), and on film (Freaky Friday) and continues to work throughout the professional dance scene in Vancouver. People LOVE Graeme's fast paced teaching style. Susan Nase is a tap dancer, singer, and Scottish highland dancer born and raised in Saskatoon SK. After a brief career as a chemical engineer in Calgary AB, Susan took her artistic talents to New York City in 2008 where she was selected to perform with 7 other world-class tap dancers in the US tour of Thank You Gregory! A Tribute to the Legends of Tap featuring Maurice Hines. During her 4-year stay in NYC she had the pleasure to perform with some of the city’s top choreographers, including Bessie Award winning Michelle Dorrance, Max Pollak and his troupe Rumba Tap, and fellow Canadian Lisa LaTouche. Currently, Susan is working with renowned Kathak dancer Amika Kushwaha on ‘Tatkaar’ which creatively blends the complexities of the centuries old Indian Classical Dance, with the contemporary American art form of Rhythm Tap Dance, to explore percussion through dance.